‘Death cap Amanita phalloides: prolonged and violent vomiting and diarrhoea accompanied by severe abdominal pains, lasting for a day or more. Typically this is followed by an apparent recovery, when the victim may be released from hospital or think their ordeal over, but death results from kidney and liver failure within a few days. 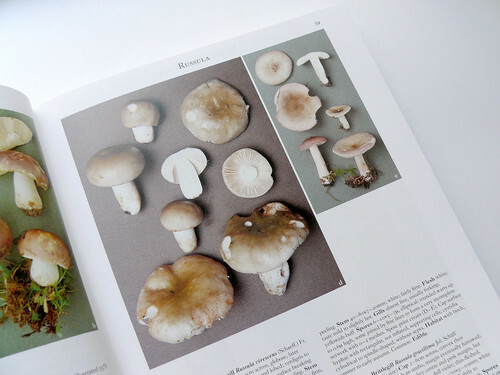 Not many books make the difference between a delicious snack and dying horribly, but Roger Phillips’ comprehensive guide to mushrooms of the British Isles does just that, writes William Hall. If it wasn’t so big it would be the ideal companion to a walk in the English countryside. 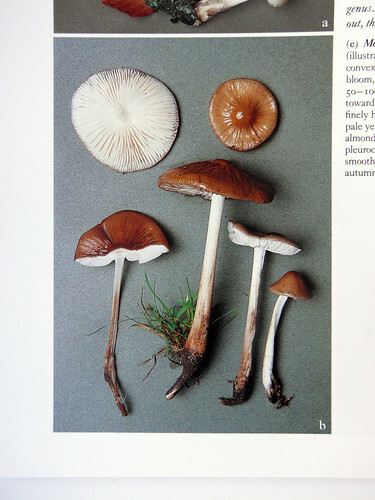 Phillips revolutionised mushroom identification when the forerunner to this book (Mushrooms and Other Fungi of Great Britain and Europe) was published in 1981. Pioneering the use of colour photography where drawings had been the norm, Phillips created a series of plant books of which Mushrooms (Pan Macmillan, 2006), designed by Jill Bryan, is just one. Collectively his books have sold almost five million copies. Divided by genus, each species is represented by an entry detailing every aspect of identification – size, colouration, shape, texture, habitat, and so on. But it is the images accompanying each entry that elevate this book from manual to bible. Each photograph shows a collection of specimens at different stages in the mushroom’s life cycle in a single shot, usually with some trails of the wood from which it has been harvested. The samples are photographed on coloured paper backgrounds of muted woodland hues, which makes the effect of flicking through the book satisfying and comforting. An alternative design with uniform backgrounds throughout would seem prosaic and overwhelming in comparison. Books are often created on a production line. They are produced to accompany an exhibition, to sustain a writing career, or to reinterpret a proven formula. But some manage to transcend this, and Phillips’ Mushrooms is one of these. Whether it is the long process, or the clear manifesto, he has made a book of real quality, and of lasting importance. 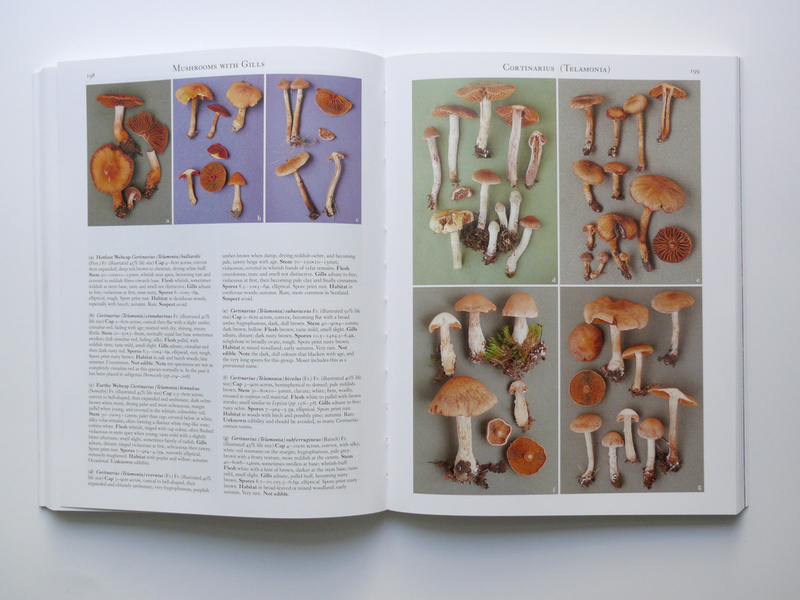 Mushrooms is not flawlessly designed however: The text is poorly spaced in places; it’s difficult to compare the scale of the samples; and the coloured backgrounds of the photographs – the very thing that makes the book so special – actually hinder the viewer’s ability to compare the specimens accurately. Apart from that many would consider its 384 B5 pages too physically big to serve as a field guide. William Hall is a London-based graphic designer whose projects range from cookery books to Calvin Klein catalogues. Read his thoughts on whether now is a Golden Age of typography in the latest issue of Eye no. 71 vol. 18, currently on press. See our Q&A with William in Eye no. 68 vol. 17. The Form of the Book 1. Time to consider a more holistic approach to publishing design?